About Chinese Antique: Is Noritake China A Worthwhile Addition to Your Porcelain Collection? Noritake china production began around 1876 when the Morimura Brothers formed a company of that name in Tokyo and opened an export office in New York. They initially produced a full range of china marked with the Nippon mark and also sold china in-the-white, ie; blanks for decorating by outside agencies and decorators, thus the quality of the earlier finished product can vary. In 1904 the Morimura Brothers formed 'Nippon Toki Kaisha Ltd' and setup a production facility at Noritake near Nagoya on the Japanese island of Honshu. They registered their first Noritake back stamp around 1908 and registered their first Noritake mark in the USA around 1911. There is high demand for good quality pieces, even with some wear to the handles, which is quite common, and they can fetch good prices. Japanese porcelain has almost always been good quality and has almost always been collected, but Noritake is probably the lesser cousin to the more desireable Kakiemon, Satsuma, Kutani and Imari wares. However we find it appeals to oriental porcelain collectors and that there is a good market for it. The American architect Frank Lloyd Wright probably thought so too, when he designed tableware for Noritake in the 1920's. The tableware was produced for the Imperial Hotel in Tokyo. There are three commonly seen Noritake marks, namely the Noritake Maruki (often called Komaru) Mark, the M (for Morimura) Wreath Mark and the RC (for Royal Crockery) mark. Between 1890 and 1921 the company marked their export china with 'Nippon' in western characters. These Nippon marks can date pieces to the 1890 to 1921 period, before the McKinley Tariff act demanded 'Japan' was used. After the first World War all Noritake production was marked 'Japan' or 'Made in Japan' to comply with the McKinley Tariff Act, and Nippon was only very rarely used after 1921. The use of Nippon can sometimes cause confusion as some pieces bear marks that state simply 'Oriental China, Nippon' around a rising sun. These Nippon marked pieces are highly desireable but collectors should be wary of faked Nippon marks on later pieces, particularly from the 1960's. After WWII, from 1948 to 1952, Noritake China was marked in slightly differing ways, the most common marks used included 'Occupied Japan' or 'Made in Occupied Japan'. Also Immediately after WWII, and due to an inability to maintain quality standards, the company stopped using Noritake on their marks and used 'Rose China' alongside a rose with 'Made in Japan' or 'Made in Occupied Japan' below. From about 1963 the company marked their china with 'Noritake Company Ltd'. 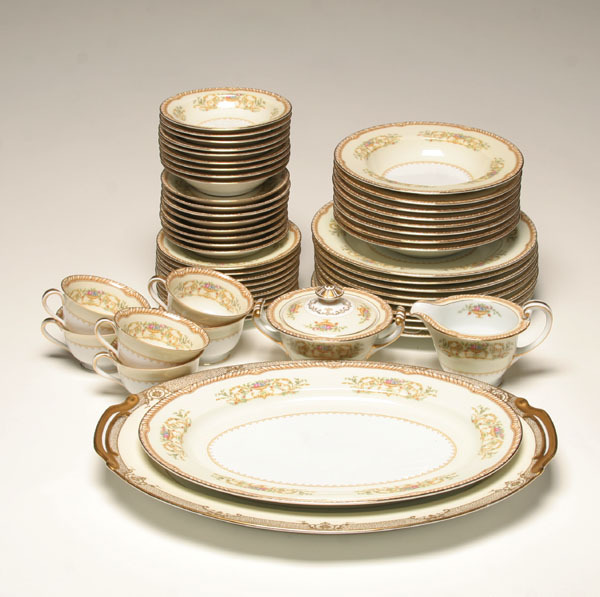 There are marks that include pattern or series names including Impromptu, Oneida, Grandceram, New Lineage, Noritake Tea Collection, among others. The most current mark includes 'Noritake Bone China' above a grecian style urn, within a wreath and with ® and Japan below.